I have been a car collector for 35 years. 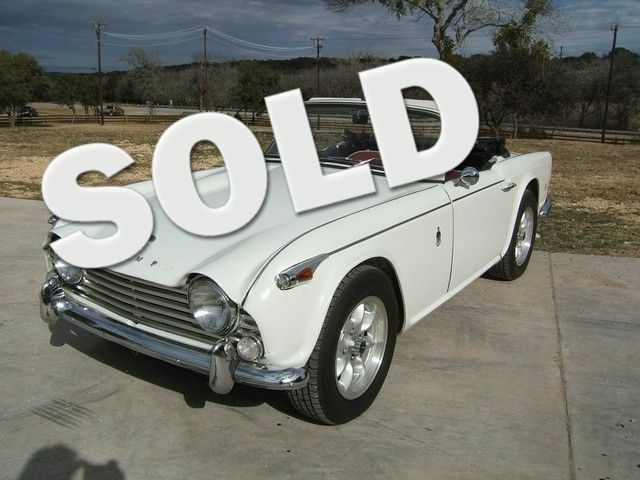 This is one of the classics from my personal collection, see others at www.gccc.us I purchased this Triumph from a sporting lady in her 70's. She had the car down for a complete frame offf Restoration. Most all British cars where painted same body color all over including the inner fenders. One sure way to see what detail was done in the supposingly frame off restoration..Even had the genleman who restored this fabulous Triumph call and leave me a voice mail he would like to buy it. . . His vm got deleted, Mr Restorer iffff you by chance see this give me a call. Who else would know first hand the quality and details in restorring this fine Triumph/ Engine and other components of this automobile have been completely rebuilt. Click Vehicle History below to look at this list! OPTIONAL EQUIPMENT ?? ?leather seats ?? ?stainless exhaust ?? ?Pentax electronic ignition ?? ?IRS=Independent Rear Suspension ?? ?Durasport aluminum wheels with Cooper tires ?? ?Steering wheel is an upgrade to a new Mota style 3-spoke wheel ~~Engine and other components of this automobile have been completely rebuilt. WOW look at this list! ?? ?TR6 fuse box ?? ?Stainless Exhaust ?? ?High torque starter ?? ?Fast round camshaft ?? ?Fuel lines are all new ?? ?New electric fuel pump ?? ?Pentax electronic ignition ?? ?Spin on oil filter conversion ?? ?Dry cell extended life battery ?? ?Larger pistons installed 87.5 mm ?? ?Rear oil seal conversion upgrade ?? ?New valves, springs and retainers ?? ?New master cylinder and slave cylinder ?? ?New headlights with Halogen upgrades ?? ?New oil cooler with steel braided lines ?? ?All new Copper and nickel hydraulic lines ?? ?Has new U-joints and has been balanced ?? ?Carbs have been rebuilt by Joe Curto of NY ?? ?Heater and wiper motors have been rebuilt ?? ?Cylinder Head has been ported and polished ?? ?Convertible top is new, all windows are clear ?? ?Brake calipers were rebuilt with stainless steel pistons ?? ?10 blade electric cooling fan with adjustable thermostat ?? ?All new rubber seals and gaskets and rubber hoses replaced ?? ?All inner engine components have been lightened and balanced ?? ?Steering wheel is an upgrade to a new Mota style 3-spoke wheel ?? ?Durasport aluminum wheels with Cooper tires (new at time of restoration) ?? ?The rear differential was removed, serviced, bearings replaced and resealed ?? ?Front and rear suspension have been rebuilt with new bushings and bearings ?? ?Gauges have all been rebuilt by professional rebuilder in NY (name unknown) ?? ?Alternator has been replaced with a one-wire GM high output racing alternator ?? ?The gas tank was flushed and recoated and a new level sending unit installed ?? ?Dash pads are all new and the dash knobs have all been replaced with new ones ?? ?Also comes with a new tonneau cover can cover 2/3 of the cockpit with the top down ?? ?Gearbox was removed and rebuilt by Vinco Transmission of Florida including the driveshaft ?? ?New wiring harness with remote Master Cut-off switch (theft deterrent system) located in the glove compartment ?? ?All chrome is original and was completely disassembled, sandblasted and etch primed to the car by Advance Body and Chassis. ?? ?All new interior with original color combination. Red with white piping and black seats were done by a local professional installer ?? ?The body was painstakingly block sanded many times to ensure smoothness then the car was painted on a rotisserie to insure the entire car was painted ?? ?All chrome is original to the car and has been replated at great expense by Advance Body and Chassis. They were completely disassembled, sandblasted and etch primed ?? ?The body was painstakingly block sanded many times to ensure smoothness. The car was then painted on a rotisserie so that the entire car was painted. ?? ?Disclosures: the muffler was apparently dented during transport from the previous seller to the current owner, however, it appears not to have had any adverse effect on compression or the engine performance ?? ?Please note in the pictures that the letter "H" in the word Triumph on the hood is missing HISTORY FROM THE PRIOR OWNER Only 3633 TR4's were produced in 1967 (info from restoration tech). And this car has most if not all matching numbers. This car had approximately 40,000 miles on it before the restoration and less than 1300 have been put on it since the restoration. This car has IRS=Independent Rear Suspension as well as Overdrive which was very innovative for the time and this model automobile This was a no-expense restoration project for the owner's 70th birthday. The car was to be a replacement for his Jaguar XK120, so every nut and bolt was removed, bead blasted, painted or replaced down to the smallest one. $30,000 was invested and documented so this car is ready to drive. TR4 PRODUCTION DATES & NUMBERS While the Title lists this car to be a 1968, it has been verified to be a 1967. We know this because Commission numbers for 1967 were CTC 64148 through CTC 75172. It was probably not titled until 1968 due to shipping time from England and the time in the showroom here in the US, which was a common occurrence. TR4's were numbered sequentially as they were built. The first TR4 (built July 18, 1961) had the commission number CT1 and the last TR4 (built Jan 6, 1965) had the commission number CT 40304. Present-day Triumph enthusiasts agree that the "model year" is the year in which the car was built - no matter what the license or title says. The reason that some cars show a later year on the title is because the car was not sold until a later time and was not titled by the dealer until it was sold. (Some importers also added another small plate (STC nn) for the year in which the car was sold/titled). COMMISSION, BODY AND ENGINE NUMBERS Each car had at least three important numbers The Commission Number (CT nnnnnn) - found on the left side of the engine compartment on a plate in front of the firewall. This plate also gives other information such as whether the car was left-hand drive (L after the number), whether Overdrive was fitted (O after the number), and states the gross laden weight in pounds. Beginning sometime in 1963, the commission plate also carried codes for paint and interior colors. The Body Number (nnnnnCT) - found in the engine compartment on the right side in front of the firewall. This plate is smaller than the commission number plate and contains only the body number. Since the bodies and chassis were built separately, the body and commission numbers will probably not match but are usually within a hundred or so of each other. The Engine Number (CTnnnnnE) - found on the left side of the cylinder block (near the coil). The engine number usually does not match the other numbers because some Triumph engines were built and then sold to Morgan and other car makers. Therefore, the sequence of engine numbers was interrupted and does not match the commission / body numbers.